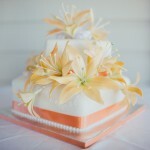 In today’s post I’ll be sharing with you some of my favourite wedding cakes from 2012. I chose just 5 of my favourites, and I hope you enjoy! Noosa wedding cake by Bonnie’s Cakes & Kandies. Bottom tier: mud cake, middle: macadamia cake, top: chocolate fudge cake. 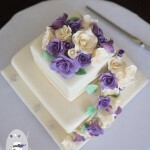 All covered with rolled white chocolate fondant, and topped with fresh flowers. Photo credit: Stewart Ross Photography. The romantic Flame Hill Vineyard in Montville was the perfect backdrop for Josh & Dorinda’s wedding cake. Individual pink & grey, dark & white chocolate mud cakes were arranged under a dark chocolate mud cutting cake. The cutting cake featured fresh flowers, supplied by Karinya Florist of Gympie. Flame Hill Vineyard Montville wedding cake and individual mini cakes by Bonnie’s Cakes & Kandies, Gympie. Dark chocolate mud cutting cake topped with fresh flowers, with individual white and dark chocolate mud cakes arranged underneath and topped with piped roses. Karyn & Matthew chose a classic design of interlocking hearts in white and dark chocolate mud cake. 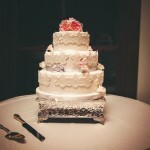 Their wedding cake was covered with white chocolate buttercream, and decorated with accents of emerald green and black. White chocolate mud cake with interlocking dark chocolate mud cake, all covered with white chocolate buttercream | Bonnie’s Cakes & Kandies, Gympie. 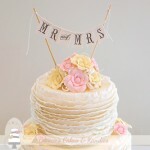 Travelling to Ipswich for an engagement party-turned-surprise wedding, Becky & Anthony’s two-tier, heart-shaped wedding cake was decorated with ivory and pale yellow tulips. The bottom tier was a dark chocolate mud cake, with the top tier made of white chocolate mud cake. Engagement-turned-surprise wedding cake for an Ipswich wedding. Heart-shaped ivory wedding cake decorated with ivory & lemon yellow tulips | Bonnie’s Cakes & Kandies. Wooden doll cake toppers from our hire range made their debut on Rob & Louise’s three-tier wedding cake. 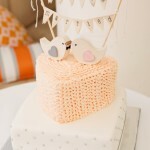 The cake was also entirely gluten free and decorated with an original Bonnie’s Cakes & Kandies design to match the couple’s ‘yellow hearts’ theme. Three separate flavours made up the individual tiers. These included chocolate mud cake, macadamia cake, and fruit cake. Wooden doll cake toppers (by Bonnie’s Cakes & Kandies) and edible yellow hearts decorated this three tier, gluten free wedding cake. Bottom tier: mud cake, middle tier: macadamia cake, top tier: fruit cake | Bonnie’s Cakes & Kandies, Gympie. Thank you to all of the couples who chose Bonnie’s Cakes & Kandies to make their wedding day deliciously memorable in 2012 – it was my pleasure to make each and every cake.